Complete the game as the Warrior. 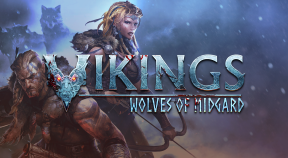 Complete the game as the Shieldmaiden. Unlock level 5 of the Smithy. Unlock level 5 of the Shipmaster. Kill four foes in a single attack. Rage continuously for over 20 seconds. Become chieftain of all the clans. Complete the game on the highest difficulty. Unlock all skills in Loki's skill tree. Unlock all skills in Odin's skill tree. Unlock all skills in Skathi's skill tree. Unlock all skills in Tyr's skill tree. Unlock all skills in Thor's skill tree. Earn 50.000 gold by selling resources. Complete all Challenges in all maps. Put three runes in a single equipment. Collect one of every rune. Accomplish campaign as Einhernjar on highest difficulty.